DotA-Allstars 6.59 AI Plus 1.52 is released. 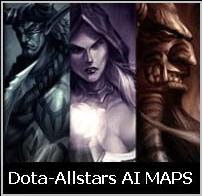 You can download Dota-Allstars 6.59 AI+ map from here. Quick AI map service from BMP :D. Below is the changelog and download link of Dota 6.59 AI map. Note: THERE IS NO AI FOR LIFESTEALER, INVOKER, CLOCKWERK GOBLIN, ADMIRAL, WINDRUNNER, STORM SPIRIT, OR UNDYING. THEY WILL GET ITEMS BUT WILL NEITHER USE NOR LEARN THEIR SKILLS. 6.59 Port of AI+ and -fun content by BuffMePlz.